This loop first goes to a transmission tower with an incredible view over "The Valley", as people of the the San Luis Valley like to call their home (as if it were the center of the universe - who knows, maybe it it is). After that the road keeps on climbing, and on the other side, well ... more below. 6. (mile36.0,8240ft) START-END WEST: jct Alder Creek Rd - North River Rd, east of South Fork. From East. East of South Fork a quiet little road parallels the Rio Grande on the opposite side as US160. From that road a turnoff is signed as "FR630 Aqua Ramon Road". The profile starts at the turnoff. A fairly straight dirt road climbs through a varied group of houses, some modern, some old, one adobe building, one church. I encounter a rag tag group of about a dozen delinquent harassing dogs, as are common in Mexico. Unfortunately there is no hunting season for these creatures. I hear the Chinese have some really tasty recipes for these animals. After I finally get rid of them, I notice the far view of the Sangre de Cristo Mountains for the first time. It is an extremely clear day with the first snowfall of autumn, outlining the peaks in white. I think in the summer, you would just look at a blue green layer of haze. The road switches back under two prominent rock outcrops now, while I am pedaling with exhaustion. At the same time one can gaze at del Norte Peak in the East San Juan Mtns. A different view of this landmark peak is immediately below to the right. The road finally encircles the second rock outcrop. To the west are slivers of white plateau tops, like icing on deep green palisades and forests over the Rio Grande. To get to the transmission towers involves a ~150ft out and back climb over a short distance. It's not included in the profile. But the final view of the Sangre de Cristo Mountains is more than worth it. Many of the pictures in the slide show below are taken from this spot. That's the last of "the scenery" for quite a while, but the road keeps on climbing anyway. Now it does so without curves, and intermittently, as the road follows a plateau top - engulfed in forest or what's left of it - and pine beetles. These trees will not be around for much longer. Actually they are gone already. After a couple of miles the road becomes much rockier without warning, and progress becomes much slower. Approaching the top, the road crosses two expansive meadows. To the north a high mountain, shaped like a loaf of flatbread, is the final destination of FR630 - but not this loop. At this point in September it is already buried in snow. To the south the Eastern San Juan Mountains make a second appearance. From here the valleys are out of sight. And the peaks look like they encircle the meadow like a big mountain park. But in reality they are on the other side of the wide valley of Rio Grande in two directions. At the next signed intersection FR630 turns right, and the shoulder summit of the route described here, crests at a small distance further, staying straight onto FR611. FR630 to the right runs along the top of Mesa Mountain - the flatbread loaf. I am told the view from the top is magnificent, and I have plans to return. From West. (described downwards) This is my less favorite side. As a matter of fact, maybe doing this as an out and back ride and skipping this side completely is not such a bad idea. The section between the top and the junction with FR610 is a bit muddy. But that's a transient condition. But the large rocks on the track below the muddy conditions are relatively permanent. And this lasts to within a couple of miles before the track ends in South Fork. There are short stretches of smooth road. But they do not last long. Views on this side are also limited. 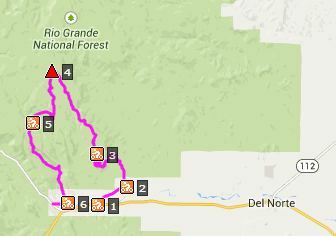 They are all of del Norte Peak, framed by a variety of forested slopes and trees. Many of the intersections are signed. FR610 to Pool Table Park offers an opportunity to extend the high traverse much longer. The FR610 Alder Creek Road turnoff in South Fork is signed as such on the paved road, that runs along the north side of the Rio Grande, through some kind of real estate development area.